We’d love your help. Let us know what’s wrong with this preview of My Little Secret by Chloe Morgan. He’s the one guy that’s completely off limits. And the only one I’ve ever wanted. My brother’s best friend. I haven’t seen him since I left for college, but he’s back home for a while, and I am too. My brother tries his hardest to get in our way, but the chemistry between us is too much. Taboo or not, he’s going to be mine. And after he is? I’ve got to hide the truth. He’s He’s the one guy that’s completely off limits. He’s got too much on his plate, and we’re keeping things casual. No way he’s going to want a baby. I can raise the little one on my own. It’ll be my little secret. To ask other readers questions about My Little Secret, please sign up. Read this in like an hour on a particularly insomnia-induced binge in the middle of the night. I was at a point where I needed something mind numbing to put myself to sleep, but this was so bad, it was almost good - the only reason I didn’t dnf this. I honestly didn’t/don’t care for this story, and I had forgotten about it altogether until I realized I hadn’t deleted it off KU. The great character and storyline development made this book a very enjoyable read! I was so engrossed in the story that I ended up reading this book in one sitting! 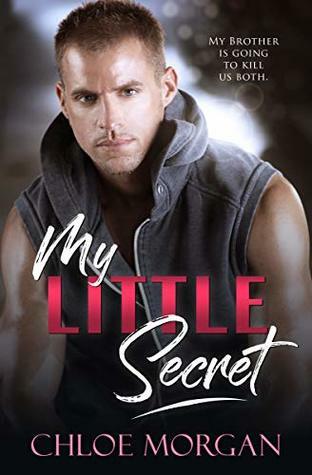 I am a huge fan of romance books and Mrs. Chloe Morgan has completely enthralled me with My Little Secret. I am so glad that I had the pleasure to read her work. This storyline grabs you from the very first page and keeps you glued throughout. Chase and Serenity have loved one another for years, even though their hearts were crushed by her Brother, Shawn. Shawn is Chase's best friend and he strictly forbade them from dating. While they both went off to college, their hearts still yearned for eac I am a huge fan of romance books and Mrs. Chloe Morgan has completely enthralled me with My Little Secret. I am so glad that I had the pleasure to read her work. This storyline grabs you from the very first page and keeps you glued throughout. Chase and Serenity have loved one another for years, even though their hearts were crushed by her Brother, Shawn. Shawn is Chase's best friend and he strictly forbade them from dating. While they both went off to college, their hearts still yearned for each other. Now that they are both back home for good, in their small town, (for different reasons) they have a second chance at their happily ever after. Follow along as these two amazingly crafted characters melt your heart and then mend it seamlessly together again as they rekindle what was once perfect. I was beyond fortunate to have requested an advanced reader's copy of My Little Secret in exchange for my honest/voluntarily given opinion and there is every single thing to love about Mrs. Morgan's book. I can not wait to see what is next from her. OMG! Heads up guys. This is one heart felt, exciting, heart pounding, pulse racing, smooth flowing, page turning delight that's as riveting as it is captivating. A whirlwind of emotions and events that really pulls those heartstrings. The characters and scenes are written with such realism it really pulls this little gem together beautifully. The characters are complex and believable with such depth and individuality its easy to relate. The scenes are so graphically ONE DELIGHTFULLY SWEET READ!!! A second chance/brother's best friend romance, My Little Secret is a short read about a couple who have obvious chemistry. When Chase & Serenity reconnect after 6 years, their old feelings reignite with more heat than before. As they deal with an interfering sibling, as well as other issues affecting their personal lives, will they find that love conquers all? I found the dialogue and plot to be quite realistic and enjoyable. Don't let the brevity of the novel fool you - it's a really good re A second chance/brother's best friend romance, My Little Secret is a short read about a couple who have obvious chemistry. When Chase & Serenity reconnect after 6 years, their old feelings reignite with more heat than before. As they deal with an interfering sibling, as well as other issues affecting their personal lives, will they find that love conquers all? I found the dialogue and plot to be quite realistic and enjoyable. Don't let the brevity of the novel fool you - it's a really good read. This review has been hidden because it contains spoilers. To view it, click here. Six years ago, they had a summer fling. Now they are older and determined to not let others come between them. Will they find their happy ever after or will others destroy it? Loved this steamy quick read. I loved how both characters were determined to not let her brother stand in their way of rekindling what they had. Definitely loved how these two had a connection throughout the years and how their families knew each other. Good read! This was a great love story, of course when you fall hard for your brothers best friend its forbidden but when you give your heart to the only man you will.ever love nothing will stop you. So when Chase finally sees Serenity again after their little courtship 6 years ago every emotion comes rushing back. He isnt letting his best friend keep him away from the one girl he had never forgotten. If you like HEA then you will love this story. Swoon worthy and Lovely...Chloe Morgan hits the right tempo in My Little Secret. The story of Serenity and Chase is one of love never completed. Yes, Chase is Serenity's big brothers best friend and time away at College didn't change the feelings she had for him. Chase has never committed to a relationship while Chloe was gone now if only he can win her heart ad-misted the other turmoil in his life. I received a complimentary advanced copy of this book from the author. Serenity is back in town after earning her bachelor and master degrees in Child Psychology and immediately goes to dinner with her mother, father, and brother, Shawn. And who should happen in the restaurant but Shawn's best friend, who also happened to take Serenity's virginity in a two month whirlwind right before she went off to school six years ago. This is a cute second chance romance novella you will certainly enjoy as I did! This was actually a really good book. It was a first read for me by this author so I was pleasantly surprised. Second chance love story with older brothers best friend. It was a short read but all in all it was a good short read. I enjoyed it. Such a cute and well written story. Had me swooning like crazy and getting pissed at certain parts. I totally became invested in the characters. Don't get me wrong, I wanted to slap Serenity a few times. Some just made me want to call her a friggin immature child, but it was still an addicting read that had me hooked. I loved the characters. The book was so good I read it in a day. I couldn't put it down. Couldn't get enough of Chase & Serenity's story. Wow. It was a hot, quick read. I'm voluntarily leaving an honest review for a copy of the book. Quick sweet read! It had some cheesy parts, but just right insta-love for a short story. This was an amazing read. The love between Chase and serenity was palpable. It didn't matter to either of them what any one thought of their relationship. This book captured my interest and has the best kind of ending. It isn't a long read eaither if you want a quick fix.